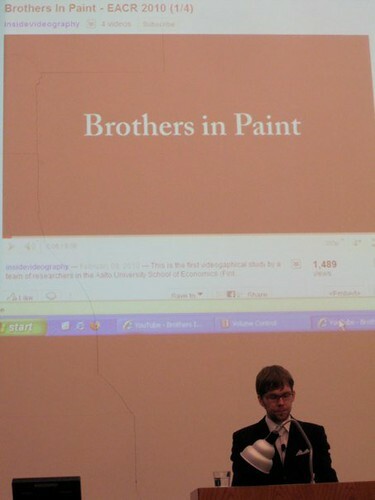 After the great experience in ACR, there was still one more round of editing to do regarding the ‘Brothers in Paint’ project. After winning the ‘Juror’s Prize’ we were asked by Rob Kozinets to send the same video to the EACR 2010 conference in London. We still felt quite unsatisfied with many aspects of our film, and so we decided to give the material one more extensive treatment. The film was still excessively long, too much of what was said in the interviews was muddied by background noise (all our material was captured in situ, and with paintball that obviously entails people frantically shooting each other in the background) and the overall soundtrack was in need of a professional touch. Obviously, we were again guilty of the classic mistake of thinking, “It’s a matter of a few touch-ups and a little cutting, I’ll have it done in a couple of days.” Well, it took over two weeks, as ideas seemed to pop up as we went along. Even the subtitling alone took almost a full week. Add the typical blue screen here and there, and my laptop came close to a tragic accidental ‘falling to the ceiling’ more than once. Video editing, folks, is some orders of magnitude more unpredictable and demanding than journal writing, believe it or not. Perhaps one day I’ll get this point to such a degree that I’ll actually have my calendar planned properly. I’m not holding my breath though. We, as self-appointed anarchists, are always looking to question existing structures. Therefore we wanted to become the worlds first to openly showcase our material to everyone. Videography, for me, can be a powerful tool for popularizing science and to be more popular, it has to be public. Therefore, here is our EACR 2010 submission in its entirety. Please enjoy! More than two years have passed since the first time Joonas crashed into my office with but a glimmer of an idea. Now the first project is complete, and were quickly branching out towards new endeavors. Our work using videographic methodology is certainly not over. Actually, its only really getting started. A diverse research team peppered with an autoethnographic angle works great – it’s all about access. Traditional ethnography is difficult in and of itself, now you have the added desensitizing and obstructing thingie called a camcorder. Plan for this, ensure a welcoming access (for each member of your research team)! There once was a time when I did not have the faintest of notions that academic research could (or in some cases should, as we wish to argue here) be conducted on video format (and some might, to a large extent quite rightly, still hold that position). Actually, there was a time when I really did not consider consumerism or consumer culture a viable option to take interest in regarding a potential academic career. This all started to quickly change, however, on an interesting (and quite faithful) day in early 2008. That day Joonas crashed into my office, and I remember there was an air of enthusiasm and urgency about him. He said we should immediately begin to plan how we could start researching my long time hobby, tournament paintball, from the perspective of consumer tribes, utilizing an ethnographic approach (myself as an autoethnographic member of the research team). Culture, from the inside, is obviously and extremely elusive concept – actually, at the time, it felt altogether utterly ridiculous to think there was something so interesting in the phenomenon of tournament paintball. I had lived and breathed it for too long. In retrospect, it was naturally exactly this that had peaked Joonas’s interest – my deep commitment to my team members and my readiness to ‘hook my wallet’ onto my paintball gun every time I set out to gather the next batch of bruises to decorate my skin. In terms of initial interest, we are especially indebted to one particular JCR article, the in-depth ethnographic study of Celsi, Rose & Leigh (1993) into skydiving communities. Hell, reading it at the time almost felt like I could just control+replace the word ‘skydiver’ in the paper to ‘paintballer’, and the story would still remain accurate to a substantial degree. Immediately we felt passionate about starting to work on a context that could potentially bring about something similar. Early on, we thought that my autoethnographic take could become an interesting starting point for this research. I had, at the time over 10 years of experience in tournament paintball. All in all, the first time I had held a paintball marker was in 1995. Joonas had, around the same time, become acquainted with Kristine De Valck, who had also expressed an interest in this research form the very beginning. We figured that a research team with varying levels of involvement in the research context could potentially bring about a very rich understanding of the consumption culture of tournament paintball. If I was the man ‘inside’, and Kristine the girl ‘outside’, then Joonas would have to become the fence-sitter. Therefore, it did not take long before Joonas was dragged to a practice session, a marker shoved into his hands, and politely told to shoot the guy coming at him ‘guns blazing’. This was the day Joonas received his first scar. He carries it still. I myself had been playing paintball on the international scene (amateur level) since the late 90’s. Therefore, an international perspective to our research on the culture of paintball tribes came very naturally to us. The department head approved our wishes to purchase cheap equipment and go about it (excluding the laptop, all the equipment, software included, cost less than 450 Euro for the entirety of this project). I started by myself in Spain as my team Helsinki Cyclone had a tournament coming up (Millennium Malaga 2008 – http://www.millennium-series.com/). It was a typically tentative first time. I went about testing our flunky equipment in various settings, attempting to capture the overall feel of the international tournament setting, and going about filming our first interviews while strenuously trying to be ever ready to kit up and play when our moments on the field were upon us. The interviews gave me hope, even if many players seemed somewhat reluctant to showcase their innermost thoughts in front of the camera – something which would come as less of a surprise today. Another thing that certainly seemed to put people off, was me trying to be overtly transparent about our research. Telling people, “This is an academic videographic study for an academic institution with an academic purpose at academia-scmemia” may be taking research ethics a bit too far. At the very least I seemed to be very gifted and successful in confusing/boring/horrifying the bejeesus out of people. Yet, as a test and a preliminary attempt at research it did seem to go well. Thanks should especially go out to Gus (today a member of the the Nexus organization) and Jeff (from Dye Inc.). After Malaga, without much further ado, I packed Joonas into my luggage, and we set about to continue exploring the scene, now at the second leg of the Millennium circuit in Toulouse. At this point we were still holding on to a very abductive mindset. We wanted to speak to tournament paintball players on many levels, find out what was on their minds, and only afterwards start thinking about a theoretical approach to this study. In retrospect, I have to hold myself back not to smirk at the naivete of our initial enthusiasm. A highly abductive outlook may be all well and good for traditional ethnography into consumption culture – not to the same extent for using a videographic methodology where you ‘either got the shot or you don’t’ (Artis, 2007)! Yet, there we were, in sunny Toulouse waiving a video camcorder in our hands. What a we must have been. Remember when I just described our first attempts as overtly abductive? Well they were, and suddenly we felt like we had conducted a dozen interviews without anything really sticking out in terms of theorizing. A thought of going to Malaga for next to nothing really stated to loom over us. And yet, just as we were beginning to doubt the whole project, a remedy came from the interviews with Oliver Lang (a professional paintball athlete – one if not the biggest name out there in the paintball world) and something of a group interview with Johannesburg Dynamix, a divisional team all the way from South Africa. Capturing their varying views on their personal passions in the sport certainly gave us the first twinkle of a half of an idea. 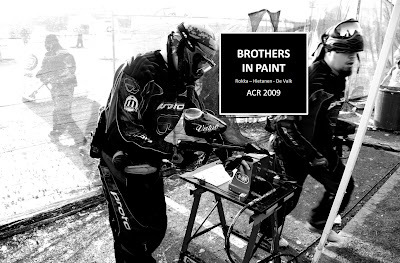 Thus we began to focus on a descriptive exploration of the entire social practice of paintball, predominantly drawing thereafter on the work on ‘practice theory’ by Schatzki (1996, 2001, 2002) among others. So it was time to continue on, heading to further Millennium events (Nurburg, Toulouse, London, Paris), and then finally the World Cup in Orlando. Artis, A.Q. 2007. The Shut Up and Shoot Documentary Guide. Oxford, UK: Focal Press. Celsi, R.L., Rose, R.L., Leigh, T.W. 1993. An Exploration of High-Risk Leisure Consumption through Skydiving. Journal of Consumer Research. 20, 1-23. Schatzki, T.R., 1996. Social Practices: A Wittgensteinian Approach to Human Activity and the Social. Cambridge: Cambridge University Press. Schatzki, T.R., 2001. Introduction: practice theory. In: The Practice Turn in Contemporary Theory, (eds.) Theodore R. Schatzki, Karin Knorr Cetina and Eike Von Savigny. London and New York: Routledge. Schatzki, T.R., 2002. The site of the social: a philosophical account of the constitution of social life and change. Pennsylvania: The Pennsylvania State University Press.